The successful Samsung Galaxy S7 and S7 Edge will soon also be available in “pink gold” colour in New Zealand. This colour option was only available in South Korea at release time. The roll-out to other markets has started and smartphone buyers in Singapore, for example, could purchase pink gold coloured S7 phones starting this week. The existing colour options for Samsung Galaxy S7 are gold platinum, black onyx, silver titanium and white pearl. Hence, pink gold is the fifth colour option. Samsung believes that pink gold is “a natural colour that provides a sense of comfort“. One wonders if Samsung’s recent colour choice has been inspired by Apple’s iPhone 6S and 6S Plus that both come in rose gold, a different name for a very similar colour, and has been a popular choice among consumers. Apple doesn’t break down iPhone sales by colour, but an analyst at KGI Securities reported that 40% of all sales during the opening weekend for the iPhone 6S were for rose gold iPhones. An analysis of iPhone 6S pre-order sales in the UK also confirms the popularity of rose gold. Image source: iphonestockchecker. 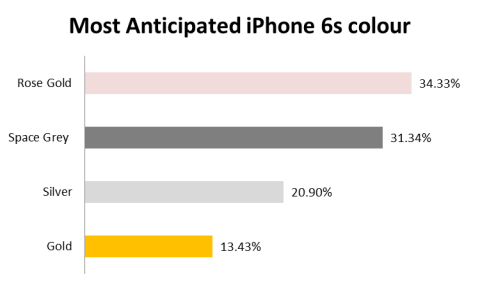 iPhone 6S pre-orders by colour in the UK. Rose gold is also a popular choice for the latest iPhone SE, and other phone makers like Huawei and Sony have therefore jumped on the rose gold bandwagon. The new Huawei P9 and Sony Xperia X Performance both try to attract shoppers in rose gold. Many men have surprisingly opted for rose gold iPhones as a colour choice despite the girly connotations being associated with a more female colour (rose gold is a pinkish looking colour option). The popularity among men has prompted many writers to call rose gold the new “bro” colour. Will Kiwi men also embrace pink gold when the colour becomes available on Samsung Galaxy S7 phones in New Zealand?